Here at Graphics MFG we love to say we can do anything sign or graphics related! 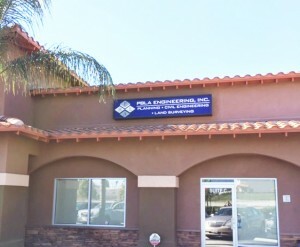 Our client PBLA Engineering, Inc. located in Irvine and Calimesa, asked us to update their commercial space, Can Sign. 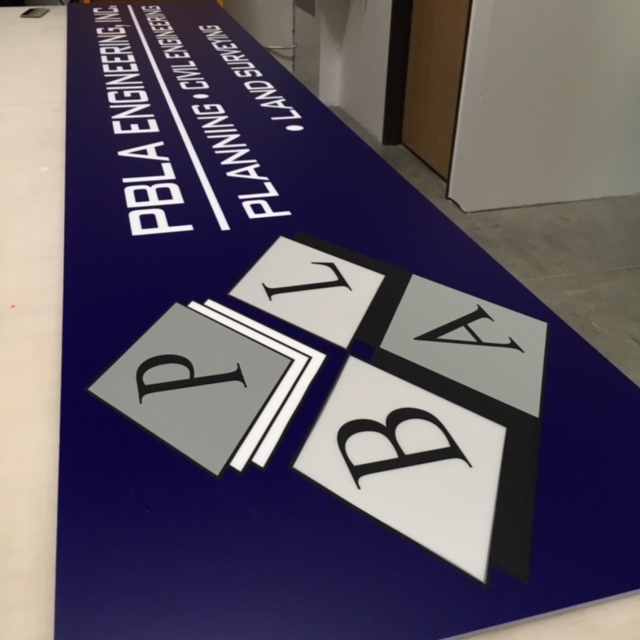 Graphics MFG laid out the design according to their current company logo and graphics. A new sheet of acrylic was purchased and CNC routed to exact dimension of the existing Can Sign on the exterior of their building. 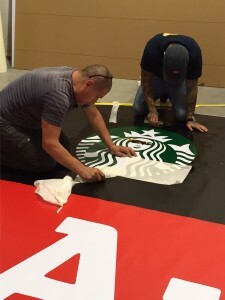 In order to make the sign have vibrant hues and to stand out, Graphics MFG went with a die cut vinyl application to the face of the Can Sign. 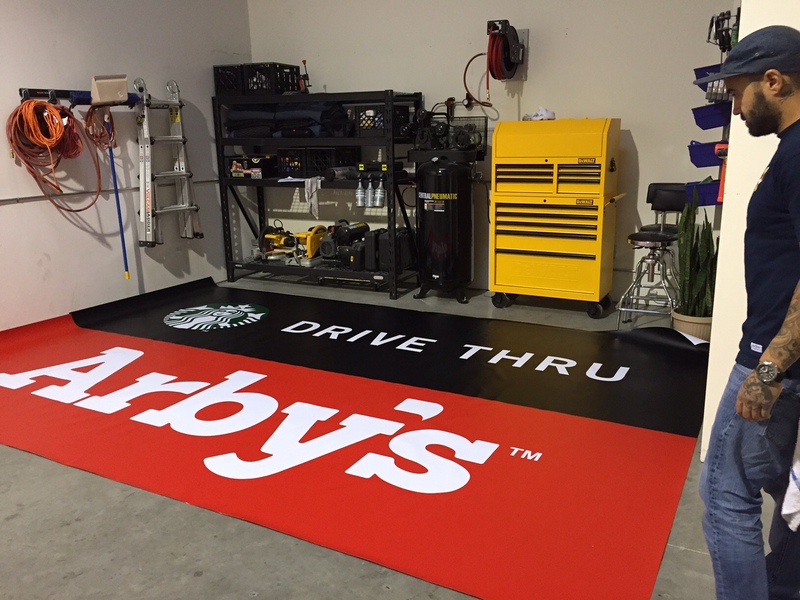 The vinyl adhesive was plotted out using our Graphtech Plotter and then applied to the signs face. Installation of the sign was the last step for us to completing this job. 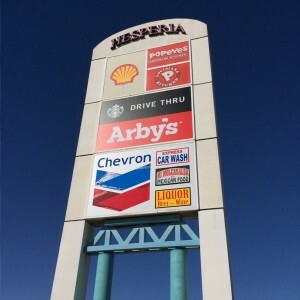 If you are thinking of updating your Can Sign we highly recommend you going with a die cut vinyl application to achieve a look that will make your sign stand out from the rest! 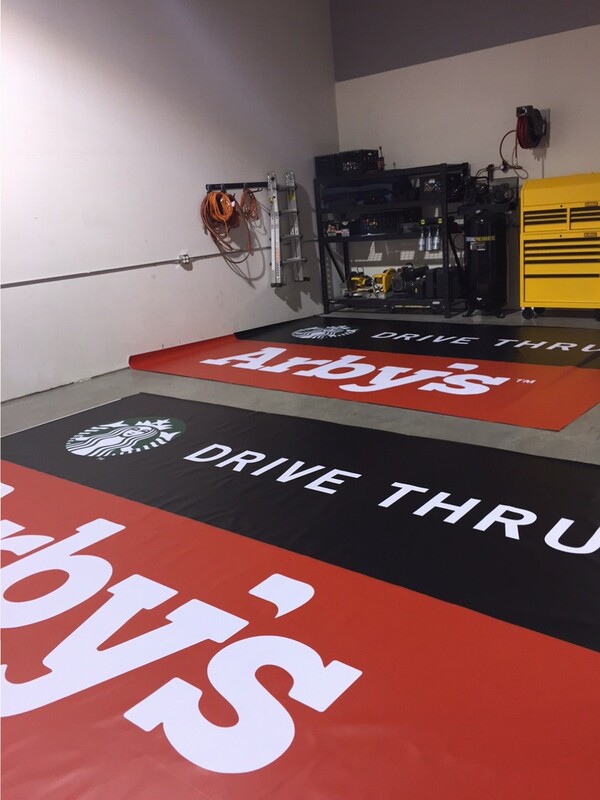 Let’s face it, this blog isn’t about a red Starbuck’s cup… but it is about the opportunity Graphics MFG was given to put the face of the Starbucks “Siren” as well as the Arby’s logo on 126″ x 187″ penaflex faces and then installed onto a sign 40′ off the ground! 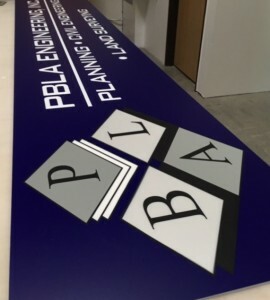 When we were contacted about this job our project manager knew the sign shop needed to be cleared out completely to make room for the massive size of these two penaflex faces. To achieve the look we used electro cut, translucent vinyl that is specifically designed for light boxes. 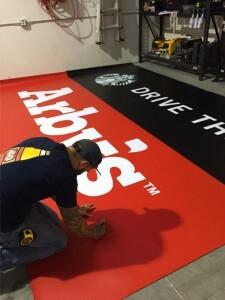 The vinyl was cut using our oversized Graphtech cutter. 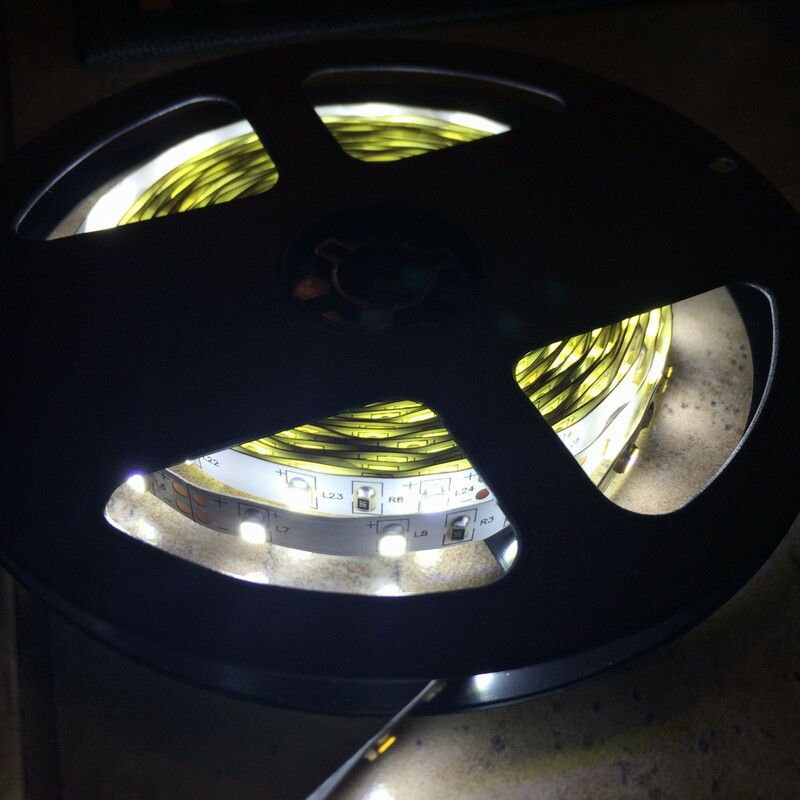 Our production team definitely had to move as one unit when applying the electro cut, translucent vinyl and the application tape to the large penaflex faces. We can proudly say we completed production of the signs in 24 hours! 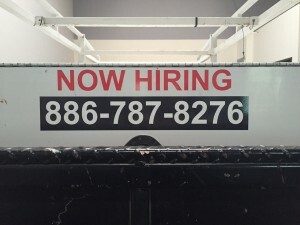 Through our extensive list and great history with other vendors in the industry we were able to color match the required pantone call outs that were requested and have the signs installed. 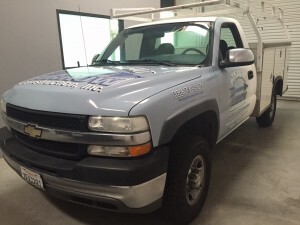 Graphics MFG prides itself in quality work and quick turn around times. 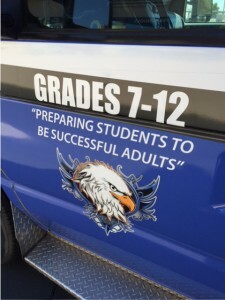 We don’t buckle under pressure of deadlines, we excel. Worried you might not make your deadline? Give us a call and let us make impossible, seem possible! 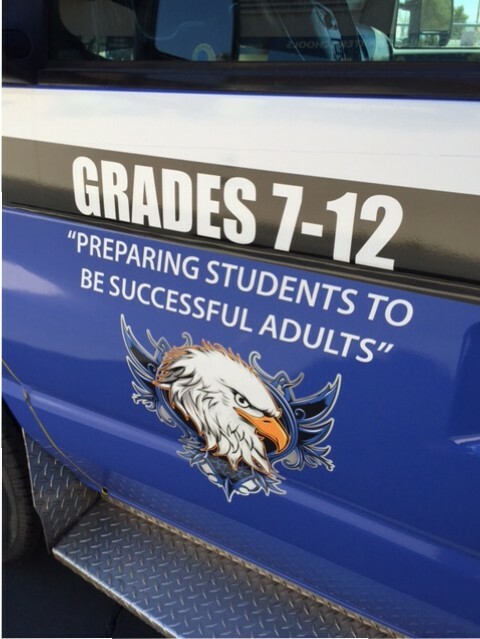 Signs is where we thrive! 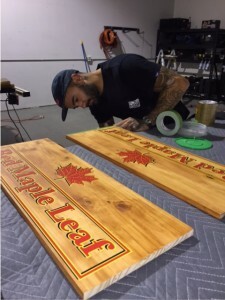 When Red Maple Leaf, a company who sells organic products called Graphics MFG to create their trade show signage, we were excited to show the client how clean of a look direct to substrate printing can be. 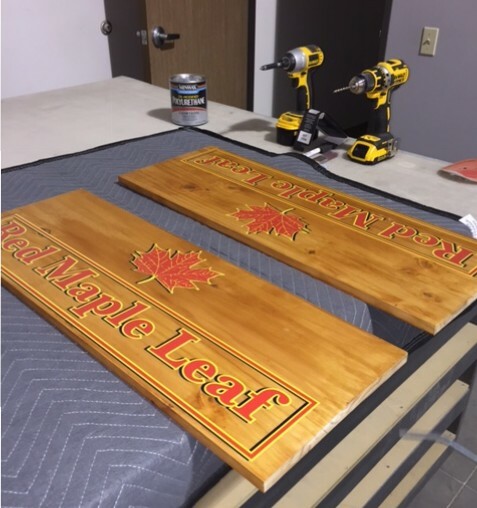 The wooden signs had to be sanded and smoothed before we could apply the wood stain. 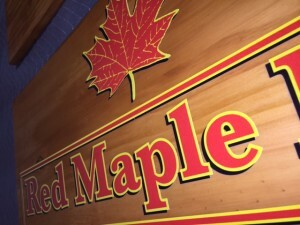 The graphics were then printed direct to substrate wood signs. At Graphics MFG we make quality products that really make our clients business stand out from the rest. No matter what look you are trying to achieve, whether it be vintage antique or industrial new, let Graphics MFG show you the quality we can deliver. 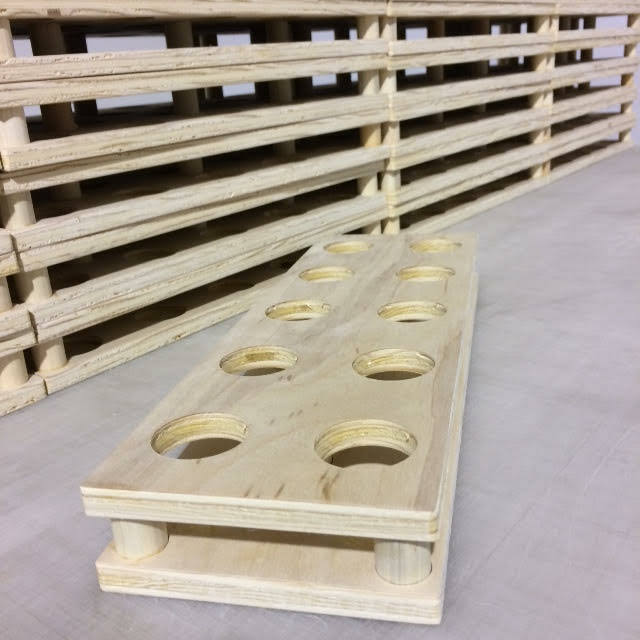 Christmas comes earlier every year… that is why Wooden Hobi asked Graphics MFG to manufacture a bulk order of retail toy displays that would house their wooden kendama game. 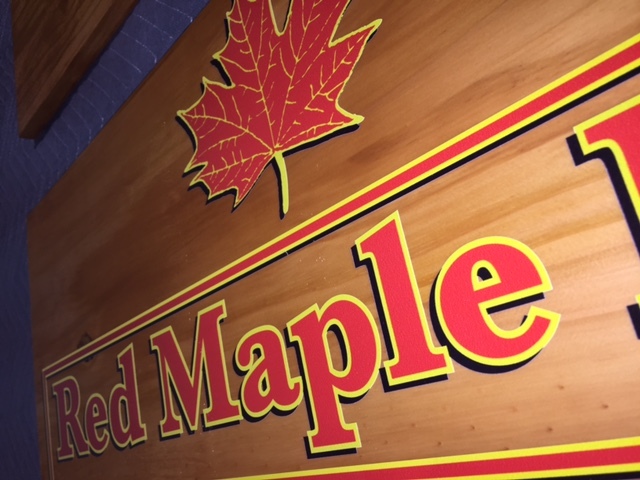 Graphics MFG was able to match the wood grain to their existing retail display and customize the design to perfectly hold the toy upright while still allowing the toy to be accessible for kids or adults to try. In order to create the clean lines and symmetry of the design we used the CNC Router and smoothed the edges with an orbital sander. This retail display is light weight, portable and can be used in different shopping centers and malls. 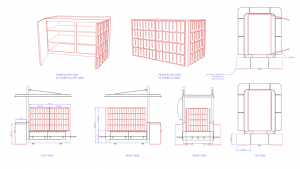 Let Graphics MFG be your merchandising solution to the busy holiday shopping season! 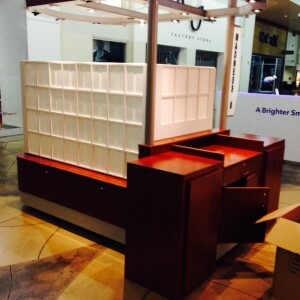 A retail vendor of Simon Malls needed a retail jewelry case. 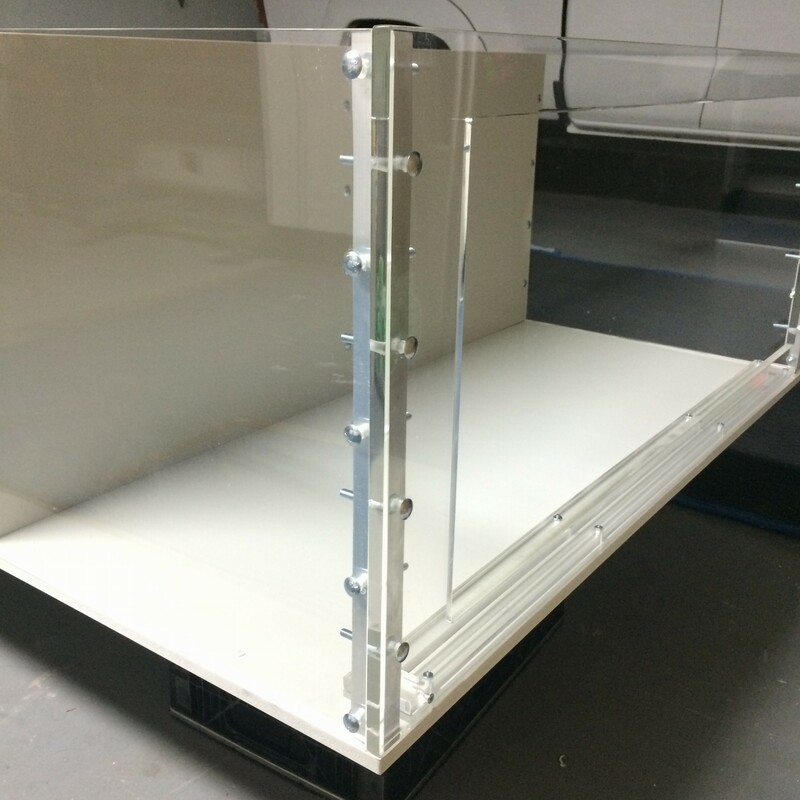 Graphics MFG designed and built a custom, one of a kind, acrylic jewelry case for their retail store. 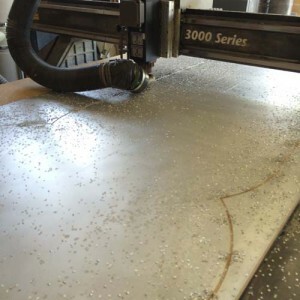 Graphics MFG used a CNC router to accomplish the fluid lines and cuts. The acrylic edges were then polished. Graphics MFG installed security locks to the acrylic sliding doors to protect our clients expensive merchandise. Adding to this jewelry case, we wired LED strip lights to really make the jewelry and merchandise shine! 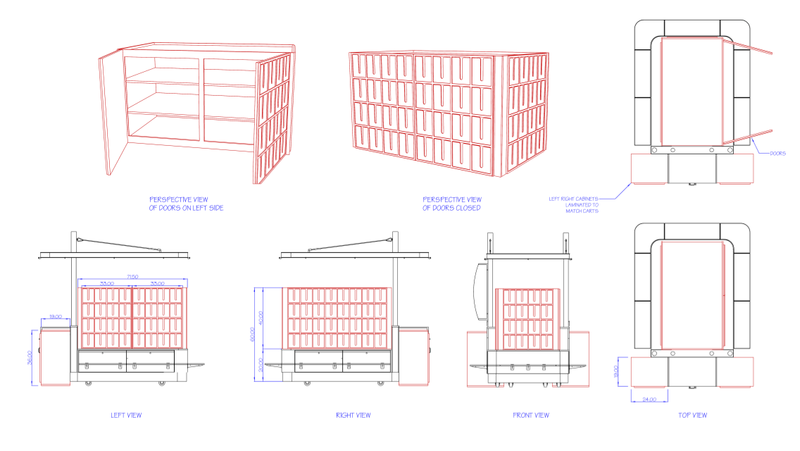 But you can’t just be beautiful, you also need to have brains… so in order to make this custom designed case multi-functional Graphics MFG added slat wall to hang long necklaces and chains. Graphics MFG is a preferred vendor and retail merchandiser for malls and shopping centers across the nation. 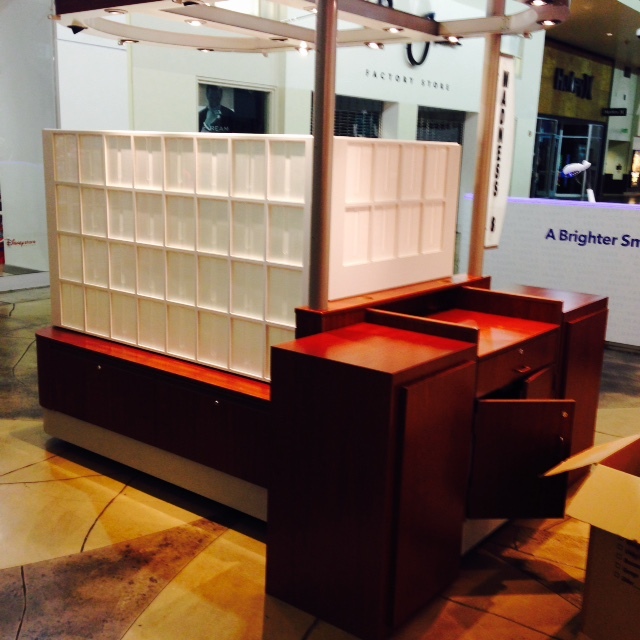 Contact us today to discuss our full service, retail display and merchandising solutions for your business! Polished Edges on the Acrylic Case with sturdy hardware. 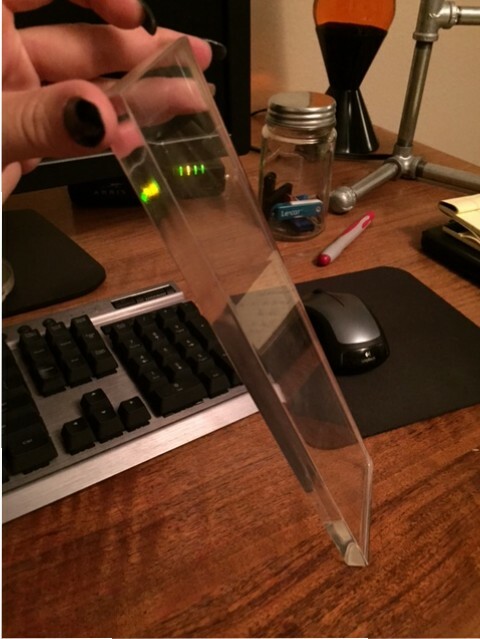 LED strip lights wired and installed in jewelry case. 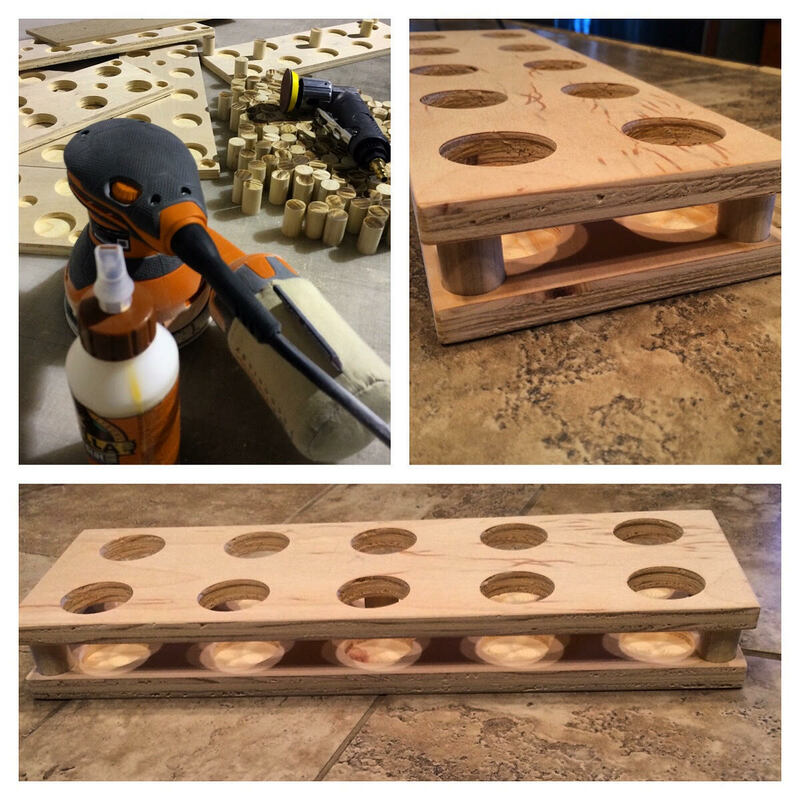 Turn old into NEW! 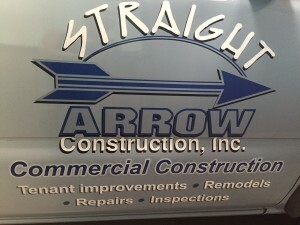 Straight Arrow Construction located in Oak Hills, CA. 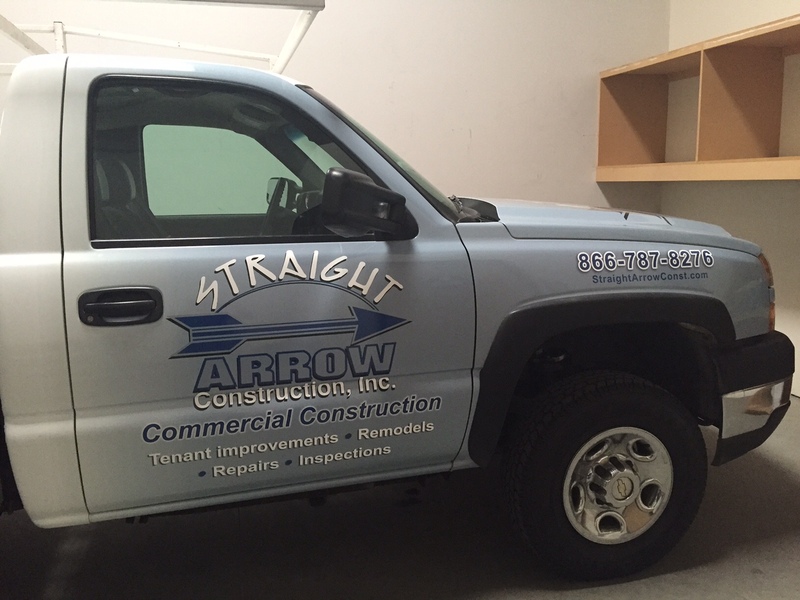 definitely had the right idea by switching out their old vinyl, vehicle decals with new custom vehicle wraps for their Chevy work trucks. 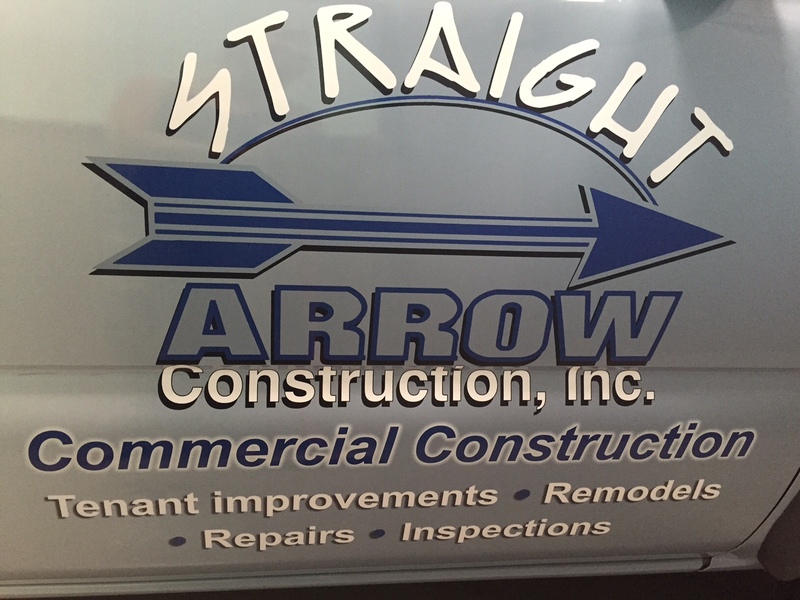 Straight Arrow Construction had previously done a vehicle wrap with another company and was not pleased with the color or service they received. That is when they contacted Graphics MFG to color match, design and lay out the graphics for the vehicle wraps to look like their other work truck. 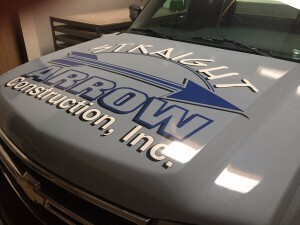 Graphics MFG removed all the old decals and prepped the trucks for the vinyl wraps to be installed, making sure the trucks have a super slick new look. The installation of the vehicle wraps were done in-house at our Ridgecrest Business Park location in Victorville, CA. If you want to “Upcyle” your vehicle or any other substrates, then a wrap is definitely a smart solution. 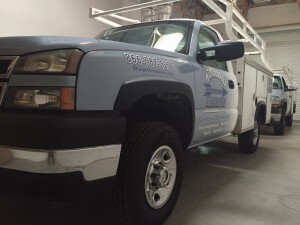 Call us today at 760.261.4358 for a FREE quote! 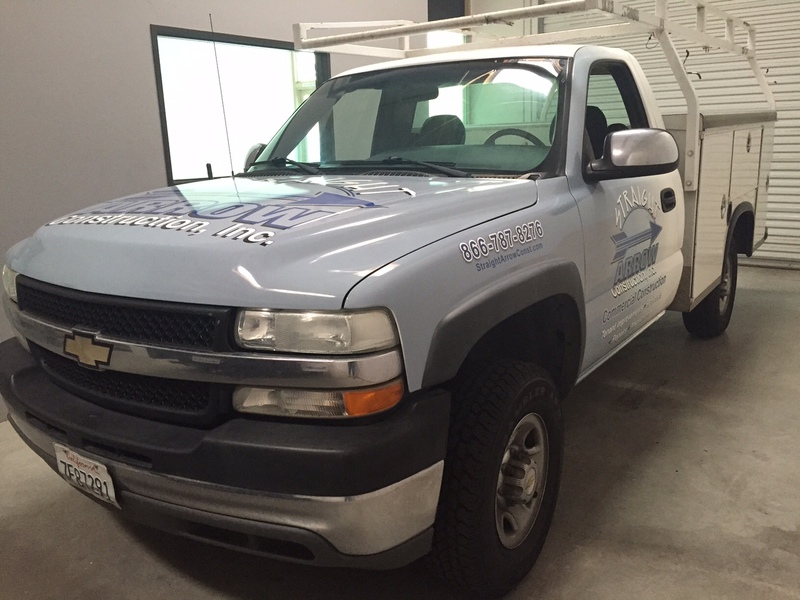 Vehicle wrap for Chevy Silverado Work Truck. 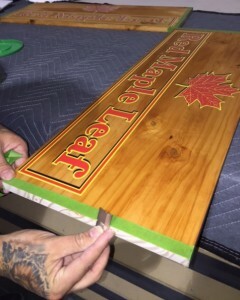 Removal of old vinyl decals. Gradient blend from gray to white. Hood Vehicle Wrap with company logo. 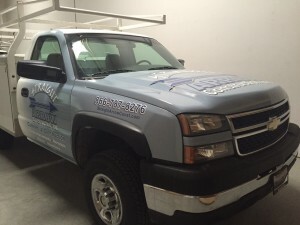 Side angle view of Chevy Silverado vehicle wrap. 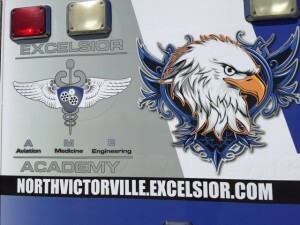 Fleet of construction trucks with final vehicle graphics installed. 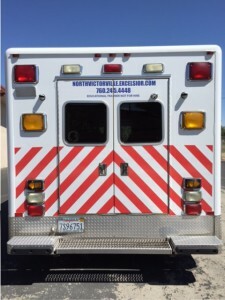 Up close view of side passenger door graphics. 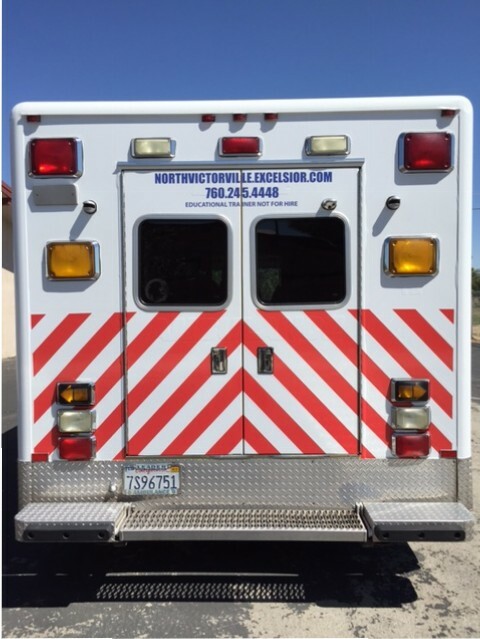 “Now Hiring” vinyl decal graphics on vehicle’s back tailgate. 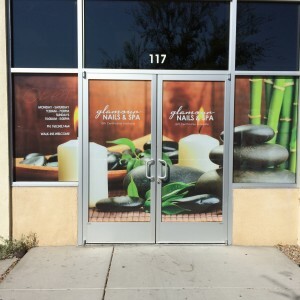 When you are in the business of pampering and making your guest feel relaxed, then ambiance is everything. 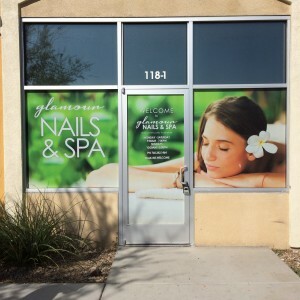 Glamour Nails & Spa wanted to accomplish this and contacted Graphics MFG for a solution. 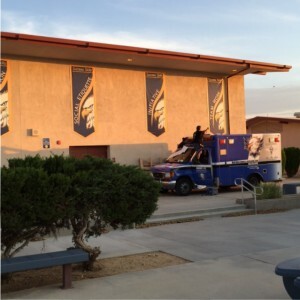 The windows were allowing too much heat and light in during the day. 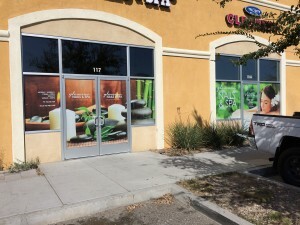 Graphics MFG decided perforated window vinyl would be the best answer to block out some of the sun and heat, while still being able to see out the windows. 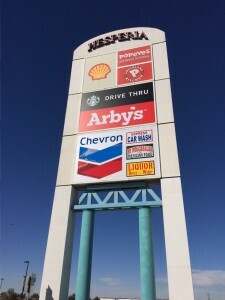 This would also allow the client to advertise their business on the front of the building. 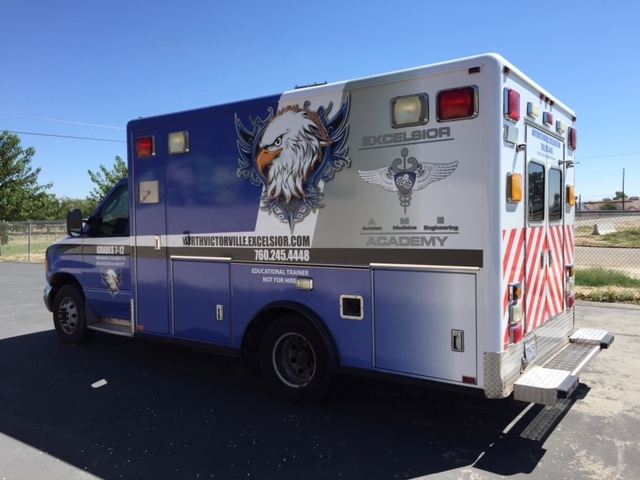 Graphics MFG designed the layout of the graphics, printed and installed the perforated window vinyl with the quick turnaround time the client was requesting. Space Utilization is Key! 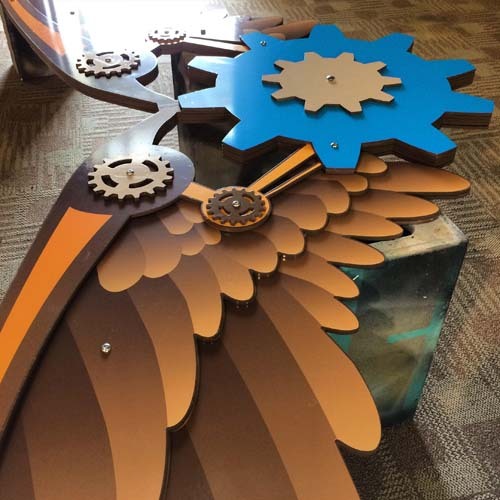 Our client, Madness 8 came to Graphics MFG to use as their visual merchandiser. 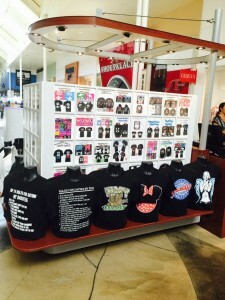 After meeting with the client we knew we had to create a compact, t-shirt cart display for Ontario Mills. 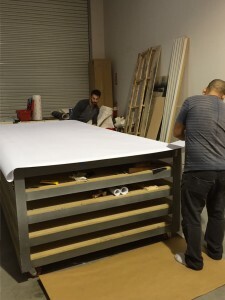 We needed to build something that gave our client storage and advertisement. 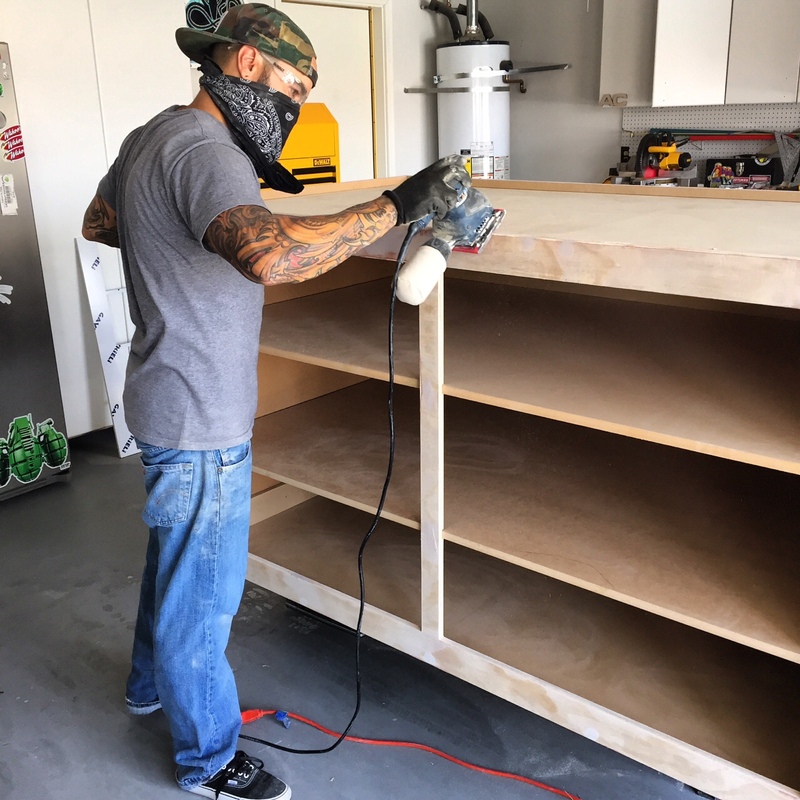 Graphics MFG began by designing the cabinets in CAD to show precise measurements and dimensions that are required by Simon Malls. 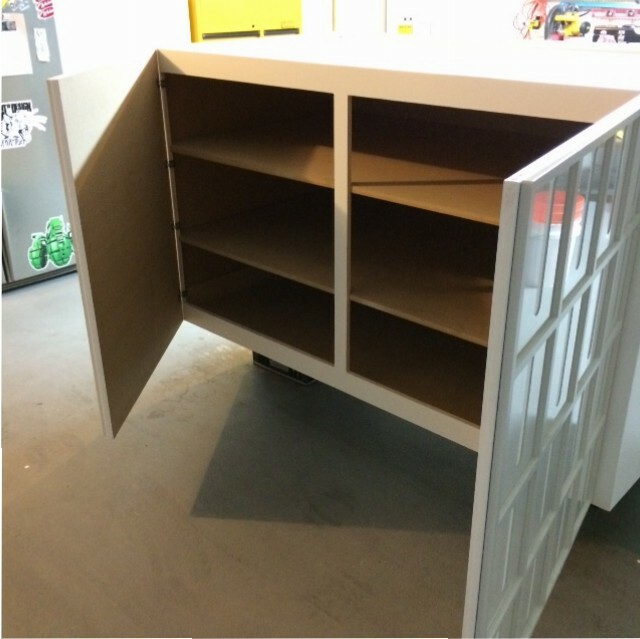 After approvals the cabinets were able to be CNC Routed and Assembled. 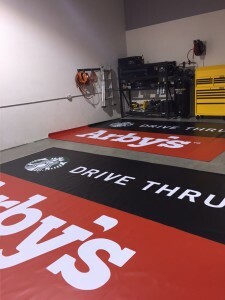 Graphics MFG was able to deliver and install the T-shirt Display and matching wood-laminate cabinets for the cash wrap side, on time as guaranteed. 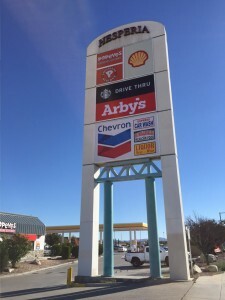 Madness 8 had a seamless Grand Opening! 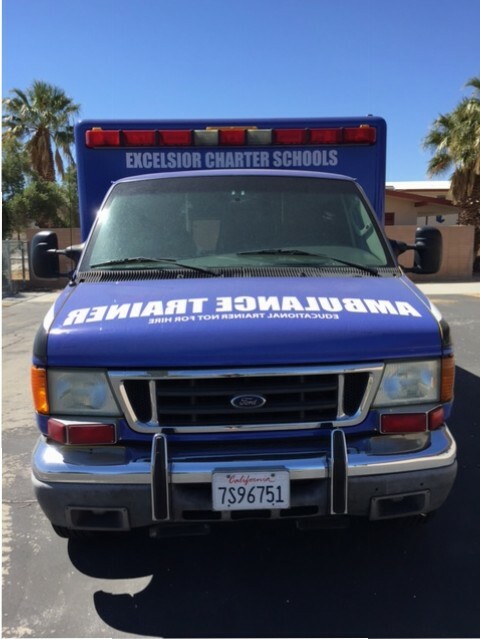 Excelsior Charter Schools purchased an ambulance as part of their medical learning pathway for students. 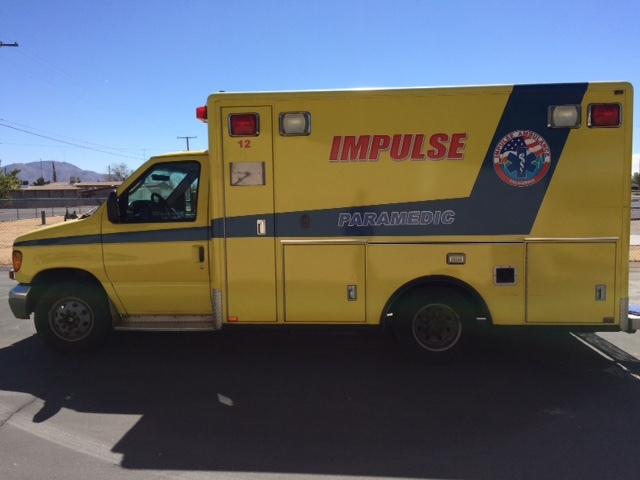 They hired Graphics MFG to do Design, Print and Install the complete vinyl, vehicle body wrap to the ambulance. 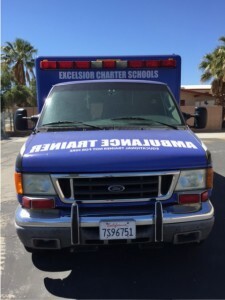 Graphics MFG headed out to Excelsior’s, North Victorville campus to install the vehicle wrap onsite as requested by the client. 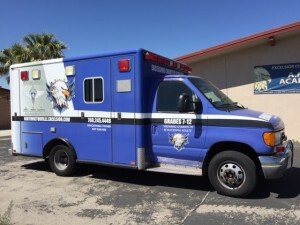 Even with the High Desert’s hot climate and windy afternoons Graphics MFG was able to deliver complete customer satisfaction! 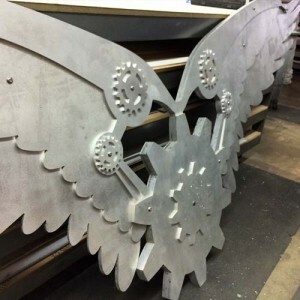 Six Flags decided to create a “Screampunk District” where Twisted Colossus roller coaster was revamped. look and feel of “Steampunk”. 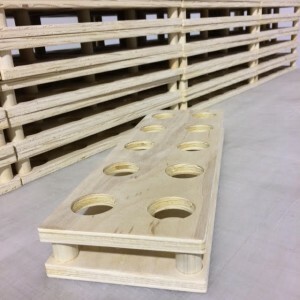 The finished product assembled and ready for installation.